Pioneers in the industry, we offer xtandi 40mg capsules from India. 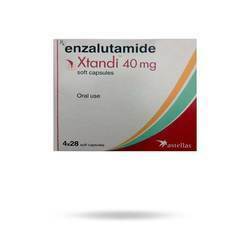 Enzalutamide is used to treat men with a certain type of prostate cancer. This type of prostate cancer has not responded to other treatments to lower the male hormone testosterone and has also spread to other parts of the body. This medication belongs to a class of drugs known as anti-androgens (anti-testosterone). It works by blocking the effects of testosterone to slow the growth and spread of prostate cancer. Xtandi 40 mg Capsule is an antiandrogens. It works by blocking the effect of the natural male hormones on the growth of prostate cells.